With urban land expected to triple between 2000-2030, understanding the ecology of cities is sorely needed to safeguard ecosystem services, biodiversity, and our own well-being. One common target of urban conservation is birds, owing to both their charisma and sensitivity to environmental change. Though urban development is a real threat to birds across all ecosystem types, a strategic network of urban habitats also might provide refuge to certain species amid rapid urbanization. However, relatively little is known about the ecological processes that influence bird communities in urbanizing landscapes. From 2001-2014, my students and I studied birds within forested parks across a rural-to-urban landscape gradient in central Ohio. Our research aimed, in part, to understand the ecological consequences of three defining attributes of many urban systems – invasive plants, abundant predators, and a rich assortment of human-provided foods. 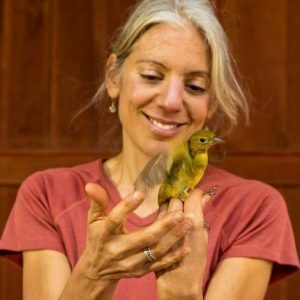 In this talk, I will share how human inputs altered species interactions in ways that affected how birds used plants for nesting, changed the nature of predator-prey relationships, and resulted in evolutionary traps. ← Dr. James van Remsen – The cavalcade of discovery of new species and genera of South American bird … and how long will it continue? Very interesting study and talk. I was surprised that Dr. Rodewald did not mention house cats as being one of the predators of birds in her study. Specifically, if they were, was there a significant difference in predation by house cats between the more rural and more urban areas of her study?